I’m starting something new this week: I’ll be featuring student guest reviews of new titles each Wednesday. That’s right. I get to the comic book store at 7:00 A.M., buy a chunk of new titles, have students stop in and grab a few, they read them, we review them. All in the course of the school day. I hope you enjoy. My plan is to feature three student writers and myself each Wednesday with two titles each for a total of eight new books! Better than my usual four, huh? Not sure how we’ll work Best of the Four since I’ve just changed the game..we’ll deal with that later. 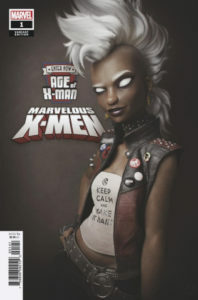 This was a pretty fun read as it contains many X-Men characters that more dedicated fans have come to know and love. The comic wastes virtually no time throwing the band of mutants into a tragedy. A forest fire threatens to ruin the city of Los Angeles, and only the X-Men can stop it. Beautiful and bright colors litter the pages in this comic. They cover everything from the vibrant paintings on the walls to the raging fires engulfing the forest. The art takes you on a journey from panel to panel, of which I enjoyed every moment. With the story, writing, classic characters, and art combined…you have one great read leaving you ready and excited for the next issue. 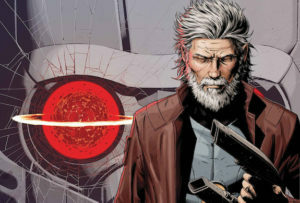 The “Old Man” stuff that Marvel does I usually find pretty cool. To see the washed-up versions of some of your favorite super heroes is pretty interesting. Guardians of the Galaxy fans, as am I, will enjoy this comic very much. Although Quill does have the cliche of being the “good looking hero that saves the day” to “washed up old drunk,” it still ends up being an enthralling read. Reunited with his old team, the Guardians explore a distress signal sent by a ship drifting through space and discover the ship has been overrun by a swarm of insect like aliens. The art is very well drawn and the comic has its fair share of action. Excellent read for old and new fans alike. I am sure you’ll be waiting for the next issue after this. The main protagonist is a gunslinging sheriff named Deadman Donnelly who responds to a threat with a squint in his eyes, and a hand on his trusty pistol. 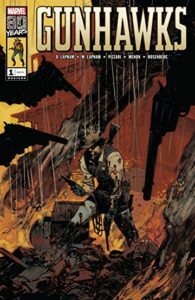 Taking place during the early 1900s, the story has a wild west feel. This story is full of hope while also portraying the difficulty in these early pioneers’ daily lives. Donnelly seems to have a mysterious past, with only a couple of backstory hints carefully placed throughout. It is obvious that Donnelly wishes to live a relatively quiet life, finding love with a school teacher in what becomes the city of Clearwater, Arizona. He seems to be settling down after a particular violent event in his life that he seems reluctant to discuss at length. The art is great, and helps display a rustic time, while also introducing some thoughtful bright colors. I ended up reading the variant cover with Marvel Comics Skrulls on it which was rather confusing…because the story has absolutely nothing to do with Skrulls! So Marvel fans, be warned, this story does not involve any interaction with the Skrull species. Although Skrull cowboys might be cool. This is an interesting read, it involves everything hard-core fans have grown to love about the Star Wars universe. It has action, violence, and a tendency to have amazing characters that are truly enjoyable to be around. This Star Wars comic takes place during the time of the Republic, which is evident due to the rather simplistic title. 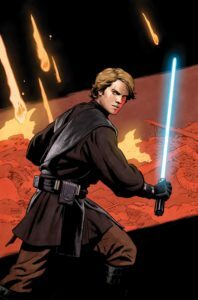 The Anakin in this series is far more mature than his “I don’t like sand…” counterpart as featured in the prequels, illustrating a character that has actual emotion, and demonstrates true control over his actions. All in all, this story is rather unoriginal: a protagonist who believes his approach to a certain situation is the “correct” approach, and doesn’t listen to the advice of his peers. The art in this book is impactful; it fully embodies the plot and overall familiar cast of characters. The story convey many different facets of Skywalker’s personality; detailing the Jedi, who wants to save innocents, while also embracing the former slave who wants to punish those who enslave. The story takes place in Hell’s Kitchen, New York, where the main character is trying to get back on his feet after an accident left him injured. While he attempts to continue to beat up bad guys as a vigilante, we see from his eyes that he has somewhat lost the previous skills he possessed prior to the accident. 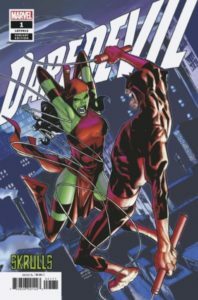 Towards the end of the book, there are a few panels of a third person view of Daredevil stopping crime and a first person view of him using his radar sense to basically see without being able to see. I cannot tell you enough how cool some of these art scenes are!! There is one fight scene in particular where his escrima stick is being thrown at one of the bad guys, and it slightly bleeds into the panel above giving it a thrown out of the page effects which I found to be pretty darn cool. This story shows the comeback of a vigilante who’s still trying to bounce back from his injuries and in doing so, causes more harm to the bad guys than he did to himself. 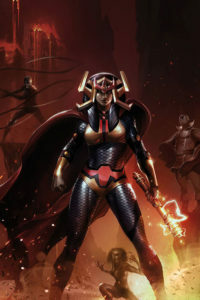 D.C.’s Female Furies, which to my understanding is part of an elite strike force of Darkseid’s. Within this issue, The Female Furies are seen attempting to gain equal respect amongst their male teammates and Darkseid himself. 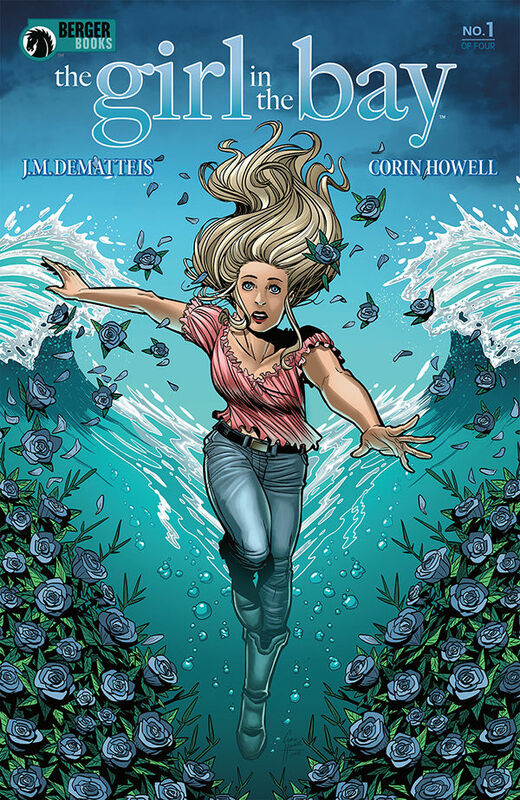 This comic has some amazing art in it and is deeply focused on women struggling for equality. Throughout the book, the women are treated unfairly because of their gender. While they attempt to prove themselves, they are constantly put down by the male characters. Within the first few pages, we are taken back to some time ago where we witness Granny Goodness (or just Goodness as the other character refer to her) fighting Darkseid’s mother, and Goodness is tasked to kill her (by Darkseid himself) before Darkseid comes back from a mission. During the scuffle, Desaad (another character within the team) comes in to aid Goodness, and then when Darkseid comes into the room, Desaad takes all the credit for killing his mother. The art in this book is amazing and the colors absolutely pop, looking like a comic book of the old days: flashy and fancy. It is beautifully executed. Being a new reader to the D.C. Universe, I’m excited; this comic got me hooked. And while the art is amazing, the women depicted in this book prove to be much stronger than that of their male counterparts, which is very cool. As this comic starts, a guy, that has been sentenced to life for murder, gets out after ten years after a DNA evidence acquits him. The detective that locked him up is not happy, convinced that this man has indeed committed the murder. Most of this issue takes place in the police station as cops yell at each other about staying out of each other’s way! 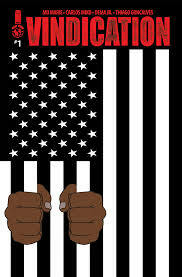 There are a few twists and turns, but for the most part, the writing is not that strong, and the pacing is quick: by page three we have a man convicted, let out of prison, and verbally attacked by a cop outside of the prison…slow down, y’all! Could be a keeper for the crime fans in the audience. 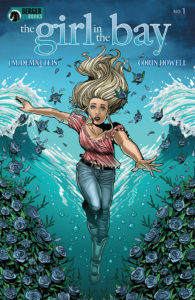 Nineteen-year-old girl in 1969 gets murdered outside of a bar in Brooklyn and tossed in a bay, only to find her nineteen-year-old self coming out of the water, unharmed, in 2019. She races to find her old family, only to find her fifty-year older self staring back at her, grandchild at her side. I don’t know where this is going, but solid story and writing. Check this one out! I didn’t think we were doing a Best of the Four this evening, but…you know what? I enjoyed The Girl In The Bay so much, I’m giving Dark Horse a point! Sixteen weeks in…Dark Horse gets point 2.